Every single Tuesday, Bernie Weiner stocks his cart. “I like everything to be neat, can’t stand it sloppy,” Weiner said. 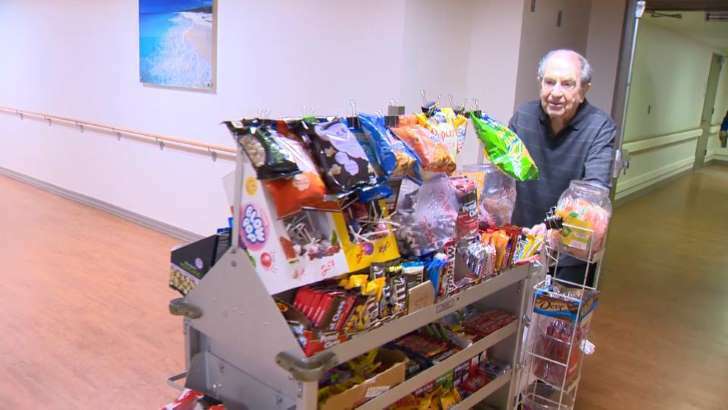 He’s not just selling the sweets to staff and patients. He brings warmth and friendship. “I have one question for you. How long have you been doing this?” a resident asked. “I’ve been volunteering here 23 years. I don’t know how much longer God will let me do it. I’m going to be 90 years old,” Weiner said. “Ninety, oh, my gosh! You don’t look 90,” the resident said. Weiner doesn’t act 90, either. The money Weiner makes goes back to the facility to help fund trips and entertainment for the residents. “He is a ray of sunshine here. He has great rapport with our residents, our patients (and) our staff. He can’t walk down the hall without being stopped several times,” said Desiree Erdman, with Levindale Guest Relations. They say candy is like childhood — something you wish could last forever. It’s a feeling that’s full circle.